Have you ever Googled you name? You should do if now. Seriously, go to Google and search for your name. If you have a common name like Bill Smith you may have to add your brokerage to the search. Take a note of the websites that Google found, then come back here to see where I’m going with this. What’s the point of Googling you name anyway? Imagine someone who needs a real estate agent. This person knows one of your clients. Your client gave this potential lead your name as a referral. That potential lead wants to learn a little bit about your before they give you a call, so they Google you. I’m sure your client told them how wonderful a job you did as their Realtor, but this potential lead knows better than to have blind faith. You would probably do the same. When that potential lead does Google your name, they will see the same websites that you did when you Googled yourself. 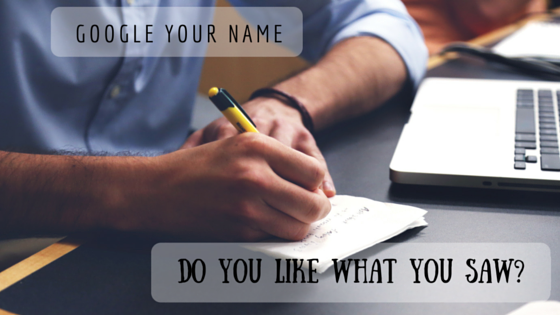 What are the top web pages that will show up for your name? The website page that your brokerage gave you will likely be one of the top results that Google returned. Will the potential lead get value out of what they will see? Is this page updated? Does it have the most current information, with your phone number, email address and every way to contact you? Is everything spelled correctly? Do all the links to your personal website, your Facebook, your Twitter, and any other websites work? Are the pictures of you from last week, or from the last decade? Please don’t say that your fax number is still on there! The challenge with your website with your brokerage is that all the branding is about the brokerage. They provide an area for the real estate agent to personalize it to a limited extent, but the brokerage gets the primary branding. So your website looks like every other agent’s website at your brokerage. So I’ll ask again, how much value will that potential lead get from your website provided by your brokerage? Zillow and other major real estate websites have such a large volume of content, and content that the end user likes, that Google ranks them very high. So your profile pages on these websites will probably be near the top of the Google search results. Do you have your contact information up to date? Have your clients written testimonials on these websites? The challenge with these websites is that their primary goal is to generate traffic. And they generate traffic by making the websites real property centric. They give agents the opportunity to have a personal page, so it’s in every agent’s best interest to create a personal profile on these websites. But that also means that any lead that you get from these websites is likely a qualified lead. Many real estate agents do a really good job of leveraging Facebook for their business. Whether you like it or not, Facebook is an extension of your brand. And there is a very good chance that your Facebook profile page will show up when your name is Googled by a potential lead. Do you have links to your website? Is your contact information up to date with the brokerage that work with, your phone number, email address, and every way to contact you? Now the important stuff: Is there anything embarrassing about you on your Facebook page that might not be the best thing for the potential lead wanting to learn about how you can help them find a home? Do you talk about politics or religion? Are there photos from the kegger in college that you might want to consider removing? People will find your Facebook page, and if they don’t call you because of what they saw, you will never know. Facebook can be a real estate agent’s best friend or worst enemy. That potential lead will find your Facebook profile. Make sure it’s safe for work, and ideally you let it work for you. The same things that apply to your Facebook page apply to your other social media accounts. Twitter, LinkedIn, Pinterest, Instagram, Google+, and numerous others. You can easily use these social networks to benefit your real estate business. Just make sure there is nothing on these social networks that can potentially harm your chances of that potential lead to contact you. Hopefully you have a personal website! A personal website is the best way to make a good impression to a potential referral. How good will you look to that potential referral if they find you have a personal website? You have total control over what is on your website. You have total control over the content. You have control over the design. You have control over the testimonials that you include. You have control over the pictures of you. You have the ability to give your name and logo (if you have one) top billing. You have control over where you brand your brokerage. You basically control what that potential lead who Googled your name sees on your website. And website made by a decent developer will rank well in Google. Sure, you can rely on the website provided by your brokerage, but your brokerage has limitations on what you can include and how it is formatted. With a personal website, you can do whatever you want. A personal website doesn’t need to look like it’s a Fortune 500 company to make a positive impression on that potential referral. Of course, having a really bad website that looks like it is from 4 years ago will leave a less than stellar impression, and a potential negative impression. Website design moves quickly so ensure that your website is updated by your designer every few years. What did we learn about your name in Google? Referrals will Google your name. Those potential leads will find information about you. The good, the bad, and the ugly. You can control some of the information they find, but unfortunately not all of it. So control the things that you can control. Review your social media accounts. Update your website with your brokerage. And make sure the real estate websites where you have accounts have your correct information. That will help for potential leads who find your name on those websites. The best way to make a good impression is with a personal website. A lead who finds your personal website when they Google your name is likely going to get all the information they need, and not even need to go to the other pages that Google returns.A personal website that is configured properly will show up higher than other those other websites, when your name is Googled. A really good personal website will ensure that the potential lead is convinced they need to work with you, have a means to contact you, and will continually use your website. So go ahead, Google your name and see what a potential lead will learn about you.